The user’s favoritereadymadeCustom T-shirt Script is available for the users to have their own custom frontend t-shirt design with preview, unlimited background color selection, latest updated features and functions.It is mainly developed for the users to get ultimate solutions for the users and entrepreneurs to start their own custom T-Shirt Design Softwaresite with user-friendly drag and drop tools.This script is now becoming emerging in sale among the users because of our bug free code reusability, advanced printing and drawing customization tools. The people can also use this script as the part timework by printing the design on the t-shirt without any guidelines steps about the tools. Our advancedLettering T-shirt Design scriptis designed with open source php platform with code flexible where the site can customized as the real-time professional t-shirt design software. The user can sign in to the site by sign upthe account or by using the referral with friend id. 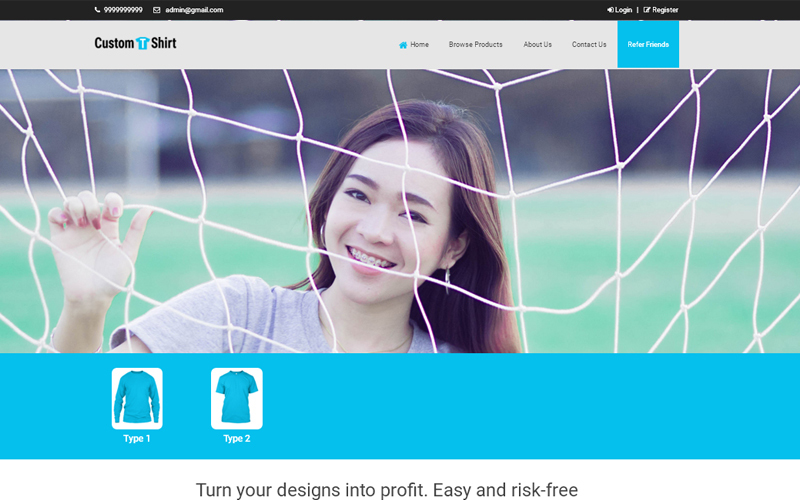 The users can upload their own design, images, and logos to print on the t-shirt, and also the users can compare the t-shirtdesign with other designs after made designing with the tools. The visitors can also get regular updates about the site by signup their mail id to the newsletter subscription. This Open source T-Shirt Designing scripthas the better reusability for the visitorsto get their owncustom design t-shirt packages with online form their place. The user can select the preferable tools, drag and drop the designs from the unlimited design and also best revenue script for the users to refer and earn the profit by using the referral id. The visitor can select the product by seeing the products images, sizes, description, reviews and comments etc, and then the products can be added to the wishlist and can make the online payment.This script is customized as the real-time t-shirt design software. The Lettering T-shirt Design scripthas the admin panel where the site can manage by the site adminby managing the sales report, product report, user management, recent purchase etc, with zero complexity of handling thevarious managements. The visitor comments can be added or removed by the admin and also the products categories, products, images etc, all are handled by the admin. The sales reports can be easily view and report can be generated for the accounting purpose. The order management is easy for the admin to analyze statistics the payment report by seeing the payment status, delivered status, etc. We provide services to all around the globe with user fulfillment and user requirement. In addition we provide 1-year technical support, 6-months free update and brand-free site.